Well, it’s been a while since I’ve posted here. Wondering why? Well, we welcomed the newest member to our family! 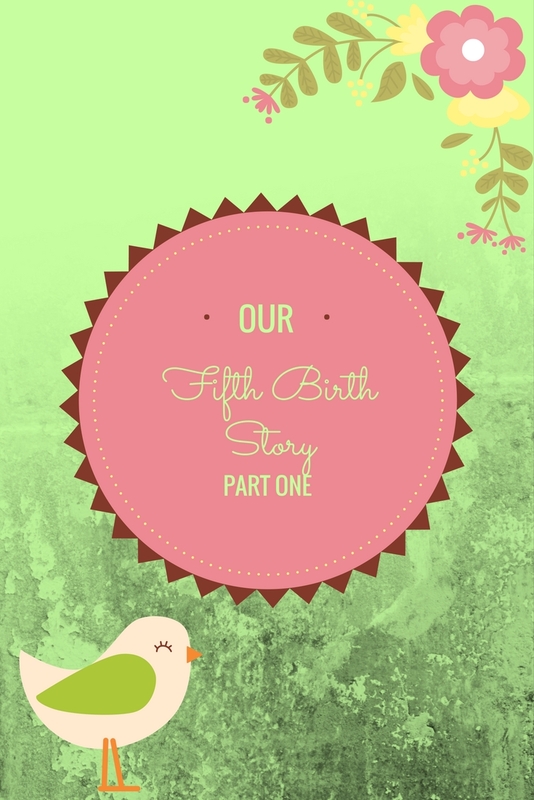 This birth was an interesting journey, and a bit of a wild ride…from the very beginning! Monday morning, we had an appointment with our doctor for our 40 week check-up. Imagine, for a moment, this scenario: You are heavily pregnant, sitting at the doctor’s office…with you four older, very bored children. It’s the day before your due date, and your blood pressure is starting to run just a little bit high. So, the doctor wants to wire you down for a non-stress test…just to make sure everything was alright with the baby. This is the scenario unfolding for me that morning. Fortunately, my husband had met us there for the appointment. None of the other kids had ever made it all the way to their due dates. Baby was measuring big, and I was sick of being pregnant. I was ready for this birth! But, at the previous checks over the past three weeks, my body just wasn’t showing any signs of agreement. We were all getting a little anxious for this baby’s birth…even the doctor! But today was a different story. I was finally starting to dilate and was about 50% effaced. The doctor pulled out his phone to decide when to schedule an induction. Andrew and I piped up, asking, “How about tomorrow?” So, we decided to go ahead and schedule an induction for the following morning. After the appointment, I called my parents to let them know it was time to come down. We only gave them 8 hours notice to get here. But, that’s a lot longer than they would have gotten if I had gone into labor on my own! They always stay with the bigger kids while Andrew and I are at the hospital for a birth. We were all excited. It was almost time for Baby! Stay tuned this week to read Part 2, where we finally get to meet our new baby! The impending birth of our fifth child has my mind racing about all things “new baby”. One thing a lot of new moms have trouble with is breastfeeding. I’ll save the bottle or breast debate for another time and place. I’ll assume that if you’ve taken the time to read this post, you’ve already made your decision for once your baby gets here…or maybe you’re already breastfeeding. You’re tired (there’s the understatement of the century! ), and maybe a little discouraged because things aren’t going quite as well as you had hoped they would. I am by no means a professional expert. You can take my advice, or you can leave it. It’s up to you. One thing I can tell you, however, is that I’ve successfully breastfed four infants for longer than a year each. 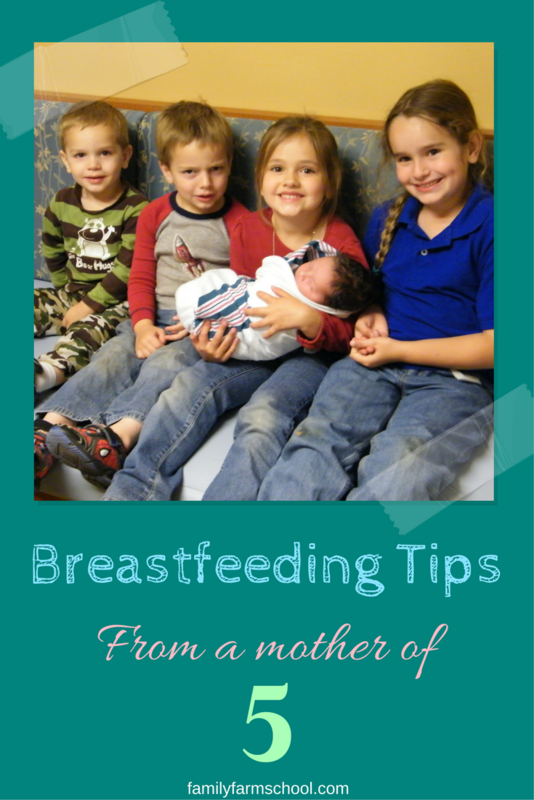 So, without further ado, here are my breastfeeding tips for beginners. Take advantage of help while you are still in the hospital. The nurses you will meet during your stay usually have years of experience helping new moms learn all the ins and outs of breastfeeding. You’d be surprised how much they can help. Most hospitals also have lactation consultants on staff. If one doesn’t happen to wander into your room soon after your baby is born, request a visit! They are paid to be there to help you. Many pediatricians’ practices also keep lactation consultants on staff. If your hospital doesn’t have one (or if you don’t use a hospital), contact your pediatrician’s office for assistance. The sooner you take advantage of help, the better. Be an expert before you head home! Hopefully, you’ve already started your research…before your baby gets here. But if you didn’t, better late than never! There are a couple of points to keep in mind. The sooner you try breastfeeding your baby after birth, the better. Give it a try as soon as they hand your baby to you. 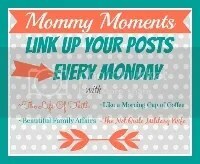 Trust me, it’s a truly amazing moment! There are a lot of common problems, many with fairly easy solutions. Things like improper latch or positioning, lip and tongue ties, low supply, over-supply, thrush can all make breastfeeding challenging…but not impossible! There are things you can do to correct these problems…some are easier than others. Learn all you can about common problems so that you can recognize the signs and get the help you need! Nearly all breastfed babies lose some weight during the first few days following birth. This was a shocker to me the first time around. I’m so glad that someone had the foresight to mention it to me before my daughter was born. My oldest was fairly small to start with…she was born at 5 pounds, 15 ounces. I had pre-eclampsia, and had to deliver a tad early. We were both healthy after birth, but if I hadn’t known to expect a little weight loss, I would have been really scared since she was already so small. I might have been talked into supplementing by some well-meaning, yet overly nosy people in my life. So give breastfeeding a fair try. Make sure you give it longer than a week! Position is everything. Make sure you are comfortable! Find your favorite spot…couch, bed, wherever. Get enough pillows to support your back. Make sure you have something to drink nearby. You’ll be thirsty, I promise. Find a nursing pillow that makes both you and baby comfortable. Personally, I like the Boppy, but a lot of people like other brands. I even know a couple who made their own! Find whatever pillow best fits your body best. If the pillow you got at your baby shower isn’t working, don’t be afraid to try something different! Make sure to get a well-fitting bra (or 6)! This is something that will be difficult, even impossible, to do before your milk comes in. There will be no doubt in your mind when that happens! Your size will change dramatically on that magical day. You will need a nursing bra before then, obviously, but it’s a good idea to wait to invest heavily in these garments until you know what size you will need for the long run. Have an expert determine the size you need. Try on several different styles if you can. Sometimes, you’ll have to order your size. There isn’t a store in town that carries my size (I’m kind of a big girl). So, I have to order mine. Try out La Leche League for some great fitting and affordable bras. It’s always a good idea to have several, because, well, leaks happen. I also have different styles depending on what I’m going to do. I have some that I can sleep in, others that I live in during the day, and a couple that work well under clothes I wear to church. You just have to find out what fits your habits. This is especially important if you plan to go back to work. Make sure you have parts that fit you…yes, they come in different sizes. You are going to be miserable if you’re working with a pump that is uncomfortable, and you might be tempted to give up breastfeeding. Even if you are planning on staying home with your baby, a pump is still a good idea. I always try to pump a little so that I can have a small stock of milk in the refrigerator…just in case I have to go out unexpectedly. Many insurance companies will pay for pumps these days. It’s a good idea to call ahead of time to find out the procedure for getting one through your insurance. Sometimes, your doctor has to write a prescription, and sometimes, you only have a certain window of time to get one. It will be well worth your time to find out! Try not to compare your nursing experience with your best friend’s. Don’t even compare your older child’s former nursing habits with this younger child’s habits. Every baby is different. My oldest took forever to finish each feeding. I had to plan on at least 45 minutes for her to eat. She was just a slow eater (and still is!). My second was a speedster, but she liked to eat a lot more often than my first. Number three had to play around a lot before he finally got down to business. My fourth was another speedster. Who knows what number 5 will do! If you think something isn’t right, get help. Don’t wait. The longer you wait, the harder it will be to get the breastfeeding relationship reestablished. On the other hand, don’t let well-meaning friends and relatives (and even sometimes medical professionals) convince you that something is wrong when you know everything is going quite well. Trust yourself. You’re the momma. You know you, and you know your baby! When Rhino was about 9 months old, we got thrush. I knew there was something wrong, but my doctor couldn’t “see” any problems. This is quite common with thrush. Sometimes there are obvious white patches in the baby’s mouth. Sometimes, a mother’s pain is the only symptom. I had to find a doctor who would believe me in order to get the problem solved. Again: trust yourself! Stand up for yourself and your baby. Don’t let anyone else tell you that it’s time to wean just because you run into a little problem. That decision is up to the two of you. Breastfeeding can be hard. There’s no doubt about it…it’s exhausting. Being a mother is hard! You’ve made a great decision for your child’s nutrition. Don’t let anyone talk you out of it. Don’t give up! Get help when you need it. Take care of yourself. Trust yourself. I wish you the best of luck on this new adventure! Storms have always scared me, ever since I was little. As I’ve grown older, I’ve learned to live with it…even though they do still worry me! It’s just an annual part of life here. You have to get used to the storms. The springtime season of severe weather is upon us here in central Texas. Whenever a front comes through, we can expect high winds, flooding rain, hail, and the occasional tornado. The weatherman always tells us we’re about to die. A couple of nights ago, one of these lovely storm systems came through. We always keep an eye on the weather during this time of year. It’s important to know the best windows for planting the gardens. So, we knew that we were about to die…according to the weatherman, anyway! In addition to our impending doom, we also had to prepare ourselves for the possibility that one (or more) of the children would wake up during the nearly guaranteed power outage that comes with these storms. The storms hit at about 2 am. They were loud. I should probably mention that our house has a tin roof. Even a simple shower can be fairly loud. Heavy rain, wind, and thunder all together can be nearly deafening! Our youngest son has never once, during the day, expressed any fear of lightening or thunder. Rhino is fearless. Sometimes, he scares me half to death (yes, even more than storms). He will try anything, climb anything, jump off of anything, or grab a stick to beat up anything…even if it’s five times bigger than he is! He is “all boy”, through and through. 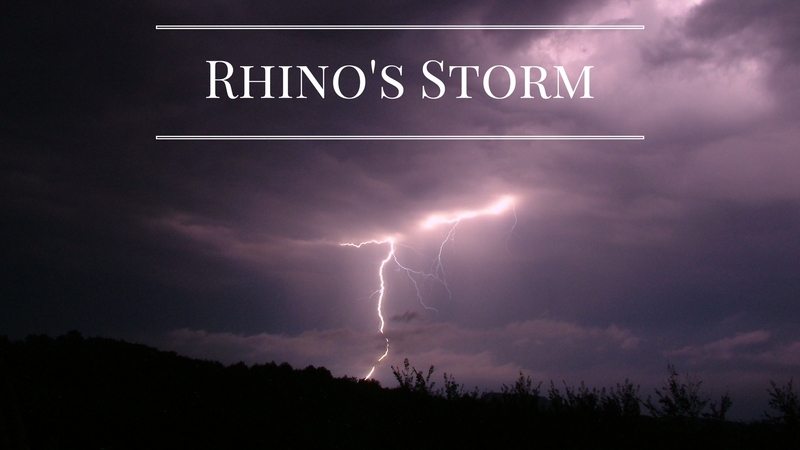 But, as soon as the storms started getting loud that night, here came my little Rhino, hurrying into my room. He climbed up into my bed, settled himself directly on top of me, sunk his little fingers into my arms, and clung there for dear life telling me, “Lightening, Momma! Lightening, Momma!” over and over and over again. About that time, there was a big crash, a flash somewhere in our room, and a popping noise. Then the power went out. We still aren’t quite sure what flashed and popped in our room…a bulb in our light fixture was out when the power came back on, so perhaps that was it. Whatever it was caused poor little Rhino to sink his little fingers even deeper into me. He wasn’t going to let me get away! Now, I was presented with a problem. Rhino was scared, and not going anywhere. But the rest of the kids have an uncanny ability to wake up and realize that the power has gone out. Then, they get scared. I don’t really understand why…their rooms were already dark. They were sleeping! Fortunately, all of the commotion had already woken my husband, so he went to take care of the other kids. But now, I had another problem. This eight and a half months pregnant momma had to go to the restroom…bad! I tried to leave Rhino in my bed, promising to come right back, but he wasn’t buying it. Fortunately, right about that time, his daddy came back, allowing me to go take care of business. It took a little while to get everyone settled back down. Eventually, we were able to get back to trying to sleep ourselves. Rhino had acquired his daddy’s spot in bed, forcing my husband out to the recliner in the living room. However, Rhino had decided that he had to be touching me in order to sleep. Every time I moved, even the slightest bit, he would startle, wake up, and grab on to me again. Being eight and a half months pregnant, laying perfectly still just wasn’t within the realm of possibility. I got up a few more times to go to the restroom, with Rhino following along behind, clinging to me the entire way. Finally, he noticed his daddy laying out in the living room on one our trips through the house. He must have decided that his daddy would be safer than his momma. He went and curled up on top of his dad…and went right to sleep. According to my husband, Rhino didn’t even move for the rest of the night. When it was time for my husband to get up to take care of all the animals before work, he called my phone which was sitting right next to my bed. All he said when I answered was, “Help!” I came in, and picked Rhino up, trying to take him back to his bed without waking him. No such luck. He wake right up, and out came the claws again. So, I carried him back to my bed. I layed back down with him fro the hour I had left to sleep. Fortunately, this time, he went right back to sleep. When my alarm went off, he didn’t even budge. He slept until nearly 9 that morning…which is unheard-of for him! His nighttime adventures had worn him out completely! So, it turns out that my fearless little boy isn’t completely fearless after all. Maybe someday he’ll find a stick big enough to beat up a thunderstorm with, but until then, his daddy and I will appreciate and enjoy the extra cuddles we get in the middle of a stormy night. Last week, my oldest daughter turned eight. We had a small celebration at home. We’ll have a party for some friends after the baby comes and we all get settled again. For our family celebration, we baked a birthday cake to have after dinner. Baking in a small, galley-style kitchen can be a challenge when you’re 8 and a half months pregnant, and roughly the size of a river barge. Add four children who want to help to the mix, and you have a situation brewing that’s likely to make you lose your mind! These experiences, helping Mom or Dad in the kitchen are so important for young children. They need to learn how to help…and actually be helpful! They need to learn how to clean up once the job is done. They need to learn how to read a recipe…and it’s a great way to teach fractions, too! So, how can you, as a parent, help them to learn all these things while not losing your mind? You want it to be an enjoyable experience for you all! You want your children to look back with fond memories of baking in the kitchen with you. I have to admit, before my kids started getting old enough to help, I had very unrealistic expectations of how these cooperative cooking experiences would proceed. We would have pretty, matching mother and child aprons. I would look like June Cleaver, with high heels and perfect hair pulling cookies out of the oven with a giant smile on my face (as if anyone can really smile while wearing high heels!). We would carefully measure, and stir, taking turns nicely while nary a drop was ever spilled. There would be no flour explosions in our perfect kitchen! Never an egg shell dropped in the wrong spot! Oh, how foolish the expectations of a young mother can sometimes be!!! Well, I’m certainly no June Cleaver, and cooking with even one child is a mess. Cooking with four is nothing short of a natural disaster of the proportion that deserves its own name! But, if I let it, cooking together can also be a hugely rewarding experience…both for me, and for the children. Bear is old enough now that she is actually quite a help. She knows how to read a recipe, how to measure ingredients, and how to make sure she gets those ingredients (completely) into the mixing bowl. Lizard is learning, but still needs a lot of help. On Sunday, she was helping her Daddy make hamburger patties, and managed to squirt raw meat juice all over both their faces! But, hey…at least she’s excited to get her hands in there and get things done. Monkey tries-but he still needs very careful oversight! Rhino…well…he can’t really be trusted not to eat all the flour! If I had never let Bear into the kitchen in the first place, she wouldn’t ever have learned as much as she has so far. If I don’t let Lizard try to measure and pour by herself, she’ll never figure out how to do it without spilling. Now, does that mean I don’t offer correction when she makes a mistake? Absolutely not! I try to patiently show her a better way, then, let her try it for herself (hopefully without the raw meat juice!). Patience is not a virtue I possess naturally. It is something I have to constantly practice and work on. 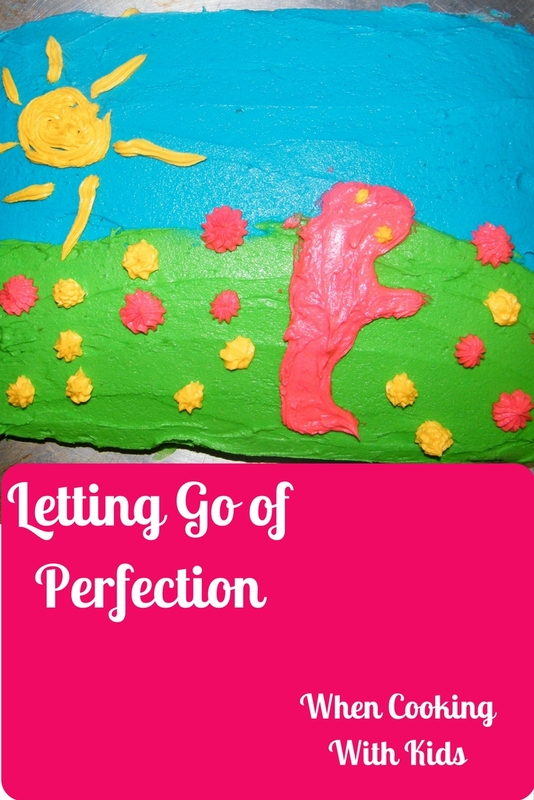 Sometimes, I have to just stop, take a deep breath, and remind myself that they goal isn’t a perfect cake. The goal is teaching my children enjoyment of an important life skill: cooking. When I can keep that goal in mind, it’s much easier to make cooking with my children a fun, relaxed experience…and that’s better for us all! Here is the finished product for Bear’s birthday cake. She frosted and decorated it herself, too. It’s a dinosaur in a field of flowers, in case you’re wondering. She has never been so proud of a cake! I’m so proud of her. She’s growing up so fast. Back when Andrew and I first got married, I was working for a diagnostic lab in the veterinary school at the university in our town. Not too long after we found out Bear was on the way, I was promoted to Laboratory Supervisor. I was responsible for making sure the lab ran smoothly, and making sure our results were dependable. Part of that job included making sure all of our machines were functioning properly, and that any new machines or equipment was set up and running as quickly as possible. I wasn’t bad at my job. I checked through all of our results daily, and made sure all the routine maintenance was done on all of our instruments. All of our chemicals were in stock and up to date. Everything was going fairly smoothly, until one fateful day. The medical director for our lab was excited. We were finally getting our own blood chemistry analyzer. We would finally be able to run our own chemistry panels for our lab’s research section rather than having to pay another lab to run them for us. He was confident we would save hundreds each month. On paper, he was right. The tests would cost mere pennies each with our own machine. He overlooked one important fact. In his attempt to save money (it was 2008…the economy was a wreck), he had ordered a dinosaur! The Hitachi 911 was a top of the line chemistry analyzer…in 1993. However, when it found its way to our lab in 2008, it was due for donation to a museum. In fact, the company that originally manufactured it informed me, when I called them for a copy of the service manual, that the Hitachi 911 would be “sunsetted” in 2009. That meant there would no longer be service parts or support available for this machine. Despite this new knowledge, our esteemed medical director wished to continue with the installation of this prehistoric beast. We would simply get our reagents and any parts we might need from a third party supplier. We scheduled a week for the used equipment dealers from which the machine was purchased to come down from Minnesota to complete the installation and training for this treasured “new” tool. The Hitachi 911 came, packed in a huge shipping crate, a couple of weeks before our appointment. So, it sat in the lab hallway. One day, my husband walked over to eat lunch with me. He saw the big crate in the middle of the hallway, and immediately had a plan for all that wood. Of course, my boss was only too happy to have someone else dispose of the giant crate. Our lab was in the basement of the veterinary college, and the hallways were small. The crate almost completely blocked up the hallway where it was sitting, forcing everyone to take the long way from lab room to lab room. My boss was anxious to get rid of it! The big installation and training day came. The instrument was unpacked and installed. That afternoon, our training began. This machine had to boot from a floppy disk. Do you remember those? There was no operating system. I found myself transported back to my early childhood, watching my dad program his big machines to make all sorts of metal doohickeys. It was fairly late in the evening when we finished for the day. I called Andrew to come pick up that shipping crate. It was dark, and we were in the midst of a rare central Texas snowstorm (and the fact that we were calling it a snowstorm amused our guests from Minnesota greatly). Andrew got the crate loaded up in my truck, and we started home. When we got there, he stacked it all up in the garage. Soon after our training, it was time for Bear to come, and I had to go on maternity leave. I was gone for 2 months. When I returned, I found that nothing had been done with the much-anticipated Hitachi 911 while I was gone. It had sat idle for 2 months. So, I started to work on getting it up and running and validated for diagnostic use. As I started running it continuously, one part after another started breaking. We would order a new part from our third party supplier, and I would use the service manual to try to replace it. Week after week brought setback after setback. Our medical director became impatient. I was working long hours, and all I really wanted to do was be at home with my new baby. I sure didn’t want to spend my days in a futile war with an ancient piece of laboratory equipment! However, while I was working late, locked in this hopeless battle, my husband was going home on time. He used his free time at home before I got there each evening carefully crafting something new and exciting from all of that wood he had gleaned from the shipping crate in which my arch-nemesis had arrived. The work was slow and tedious. He wanted to make sure that the final product would last for years to come. Four months later, I put in my resignation. I was fed up with that machine. 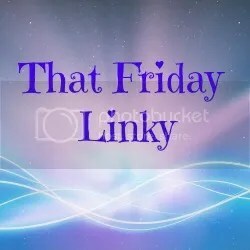 I din’t want to be there, and my husband and I were fairly certain that we could make it work on just one income, if we were very very frugal. My husband made a huge dining room table out of the shipping crate that the Hitachi 911 had come out of just a few months earlier. When he finished putting it together, it barely fit in our dining room in that little house we had it town. It was so big that we couldn’t even reach each other to pass food back and forth. It seemed a little ridiculous back then, for us to have such a large table where there were only the three of us for dinner regularly (and one of us was a little baby!). But our family would grow! Today, in our farmhouse, the table fits a little better, though it’s still pretty big. But now, that table is full at dinnertime. There are six of us to sit around it now. In fact, my husband will have to build bench seating in the near future so that the soon to be seven of us will be able to fit! It has served us well for nearly 9 years now. 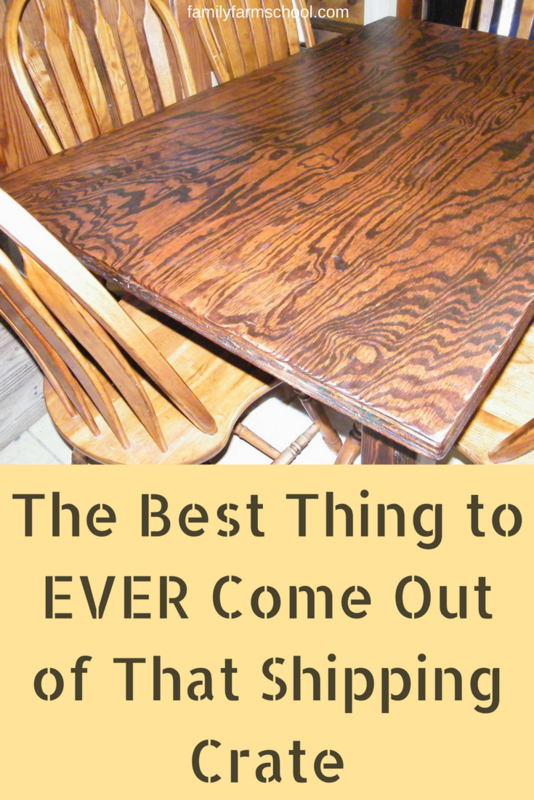 My husband and I still claim that our dining room table is the ONLY good thing that ever came out of that shipping crate! A couple of years ago, we realized we were watching way too much TV. 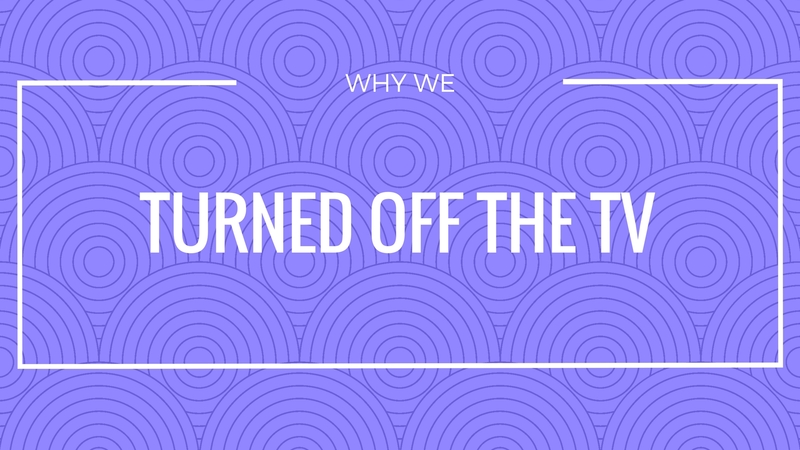 That’s mostly because, well, we were turning it on at all! Our children were growing older, and we were becoming more and more sensitive to the messages coming through that little box straight into our home and our minds. We subscribed to a popular satellite provider. For the first two years, we got a fairly decent price…you know…the special new customer contract pricing designed to get you hooked. Once the special pricing ended, however, the price skyrocketed. Of course, we knew ahead of time that this would happen…it wasn’t really a surprise, but it really affected our family budget. We had a new baby, and were a brand new family of six…and living on a single income. We were always looking for ways to cut our costs! We started doing a careful analysis of where exactly our money was going…and more importantly, was it worth it? We took a long hard look at satellite TV. We were paying a lot. It was sucking down more money every month than it cost us to feed all of our animals! But were we using what we paid for? We we getting our money’s worth? The short answer was a definite, resounding, NO! We were paying for hundreds of channels, but only regularly watched about ten. Our children watched some cartoons on the kids channels, of course. We watched our local news station. We watched mostly sports channels in the evenings. Now, for the more important question in our analysis. Was the money we were spending for these channels (the small fraction that we did watch) helping us raise happy, healthy, faithful children? Again, the answer was a big, fat, NO! Sure, there were kids shows that the children enjoyed. Some of them were even “educational”, and though not completely devoid of social engineering, they were fairly innocuous. However, when we started considering what our kids were seeing on some of the other channels we were watching, it started making us uncomfortable. We enjoyed watching a good football or baseball game, and yes, we liked watching bull riding too. Those seem fairly safe, right? I mean, what could be more important than encouraging that good ole’ American sportsmanship? But, then came the commercials…all those commercials intended to get into your head to sell you something. They’re supposed to be flashy, they’re supposed to stick with you. There were scantily clad women dancing around. There were spots touting how awful and confining it was to be “tied down” with children. There were even segments advertising our culture’s favorite ways to prevent that from happening…some of them nearly pornographic. No, these were not the sorts of things we wanted being tucked into our children’s young, impressionable minds night after night after night. Satellite television was definitely not a tool that would help us raise happy, healthy, faithful children. It would have to go, we decided. I called our service provider, and cancelled the service. They offered me all kinds of deals to try to get me to change my mind. But I held firm. Still, more than two years later, I still receive little love notes from them in the mail. They tell me how much they miss me, and how much they will do to get me back. Such desperation is kind of sad, really. We kept the TV hooked up to the DVD player, and yes, the VCR (we’re still a little old-school). We can watch a movie any old time we want. VeggieTales is often on our “Feature of the Day” list. The TV schedule can no longer rule our day. I can choose to turn it on, or send everyone out to play. To be honest, we don’t even miss it. Our evenings are full of family time. Our days are full of laughter, learning, and play. There are days when we go the entire day without any screen time at all…and we’re better off for it! Life isn’t about prime time. It’s not about sports or cartoons. It’s about spending time with your friends and family. It’s about making sure your children grow up happy, healthy, and faithful. You won’t remember the score of that baseball game in ten years. But, I’d be willing to bet that your kids will remember all the time you spent with them instead.